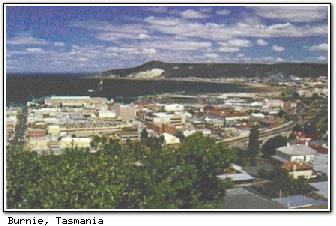 The city of Burnie (pop ~17,000) is the fourth largest city in Tasmania and a major industrial centre. The city's port has a large freight capacity and services the west coast mining industry. Burnie is built on the banks of Emu Bay (below). Local attractions include Fern Glade and trout fishing at Lake Kara. 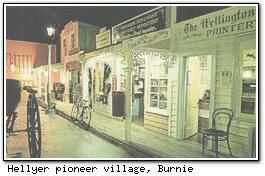 The Pioneer Village Museum (pictured right, close to the visitor information centre) offers a taste of what life was like at the turn of the century. Another of the regions industries, cheesemaking, can be viewed at the Lactos cheese factory. The Burnie Park (below) is close to the city centre. A wildlife sanctuary is in the centre of the park, and there is a walking track to Oldaker Falls. Burnie Inn (1847), the first licensed pub in Burnie, has been relocated to the park and is now a tearoom. The rhododendron could be called the "city flower" of Burnie, as there are two gardens close to the city featuring them. Emu Valley and Annsleigh Gardens each have thousands of rhododendrons and are open to the public from about September until March. 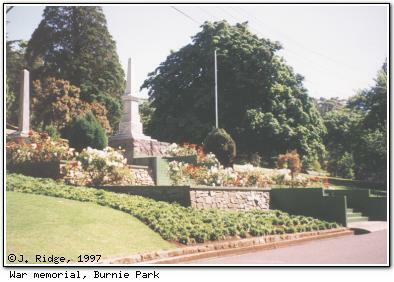 Burnie's Agricultural Show is combined with the Rhododendron Festival, held in October. Burnie has many reasonably priced accommodations, including one 4½-star, one 4-star, and six 3½-star facilities (RACT rated). Burnie is just over 90 minutes drive west of Launceston. Burnie Airport offers air links to Melbourne, and is located 19 km west of the city at Wynyard.